As we covered recently on the Fiix blog, there are a number of steps you can follow in order to put your TPM program (as dictated by the 5S foundation and eight pillars) into action. But what are the TPM tools, techniques, and software that can help you achieve the tasks you’ve laid out in your plan? According to LeanProduction.com, there are a number of different methods and solutions you can try out. Multiply the best result for each of the three OEE components to calculate your “very best” OEE score. This should be the score you work towards as a team. Our final step in our “putting your TPM plan into action” blog post was planning and scheduling maintenance activities. Of course, a CMMS will help you immensely with this. But what are the specific techniques you should be carrying out with your CMMS to ensure your preventive maintenance is following your TPM plan closely? Identify all equipment components that are candidates for proactive maintenance. This includes components that wear, components that fail, and stress points as dictated by thermology or vibration analysis. Based on the components that have been selected, establish maintenance intervals that should be followed for each component, based on wear intervals, failure-based intervals, time-based intervals, or work order-based intervals. Every replacement should be recorded in your CMMS, along with notes on why the replacement took place. A monthly audit should be performed to verify that maintenance schedules are being followed, maintenance work is being tracked, and that the maintenance intervals established are still appropriate. Adjustment of maintenance intervals should be considered if there is unscheduled maintenance or replacements. Maintenance can be tracked over time with CMMS reports to give a clear picture of problems and issues that could be preventable. Provide employees with an ideal future vision of your company, and detail the ways in which each employee would benefit in that scenario. This helps to address the “what’s in it for me?” mentality and motivate employees to strive for an ideal state. Recognizing and rewarding behaviour that supports your TPM program is another great way to incent your team to support continuous improvement. Ensuring early success in your TPM efforts will build confidence in the program among employees, and prevent it from being seen as a nuisance or an ineffective undertaking. Though this may seem like an obvious and hard-to-control technique, the takeaway should be that you should not spare resources in the beginning of your TPM efforts. If upper management does not support TPM efforts, you can bet that technicians won’t be supporting it either. Ensuring that management continually stresses the importance of TPM and celebrates the wins it creates will keep employees from drifting back into old behaviour or failing to take on new behaviour. This is where the “continuous” part of “continuous improvement” comes in. A TPM program should always be adapting to new information and conditions, so that it continues to be effective and does not become stale. As we mentioned previously, a CMMS can help you with each of the techniques suggested above. As with all major purchasing decisions, it helps to make a list of your requirements and then compare and rank your CMMS options. 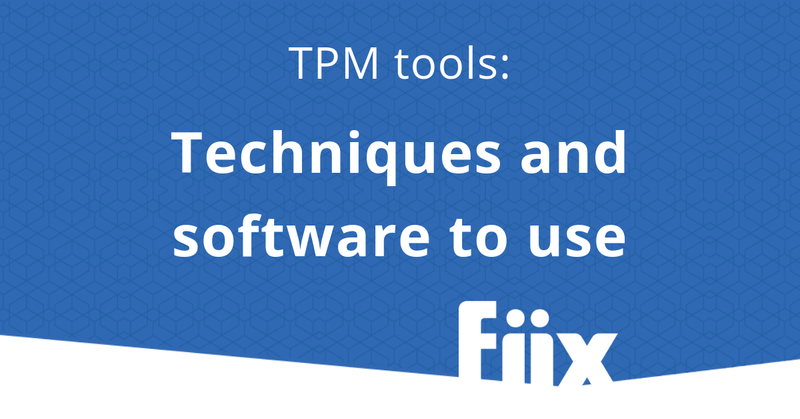 Read our latest case study about how Ardagh Group’s TPM Champion did just that and eventually transformed his team’s TPM program and maintenance operations with Fiix.